Cilantro, chopped --- 1 Tbsp. Hoagie rolls --- 4 ea. Preheat fryer to 350°F; preheat oven to 350°F. Mix TABASCO Sriracha Sauce, lime juice and cilantro into tartar sauce; set aside. Prepare tempura batter as directed on box. Coat fish in batter; place in fryer until golden brown. Cut rolls in half; place in oven until golden brown. 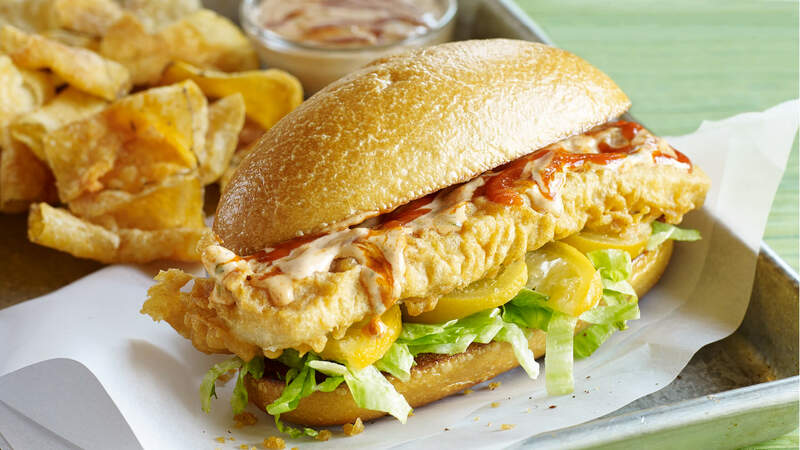 Layer lettuce and preserved lemon slices on bottom halves of hoagie rolls; place cod atop lemon slices. Coat cod with Sriracha tartar sauce. Cover with tops of rolls and serve.